Rory Calhoun starred in and produced this western for Columbia release. Like much of postwar talent, he used banks and studio advanced $ to make safe vehicles, in Calhoun's case westerns, at a price low enough to assure break-even. The indie firm was called "Rorvic" after Rory and partner Victor M. Orsatti, who'd been a demon press agent married to glamour-gals from his stable (two would leave Vic to wed real-life mobsters). Apache Territory was steps below what outdooring Randolph Scott and Harry Joe Brown did at a same time for Columbia, Apache seeming to work off a Tall T blueprint, with results not as good, but serviceable for then-goal of gas in cars/groceries on table. Action is outdoors until a siege confines us and the cast to soundstage exteriors. Violence is upped in accord with western trend, one trooper getting his with a flaming arrow to the chest; you'd hope risk of facial burn led to increased stunt fee. Director Ray Nazzaro was from mostly TV and budget-conscious westerns; there'd been a peck of the latter with Charles Starrett, then megging for Gene Autry's vid ventures. Nazarro stood for a kind who understood schedules and need to adhere by them, an ideal back-up for neophyte producing Calhoun. 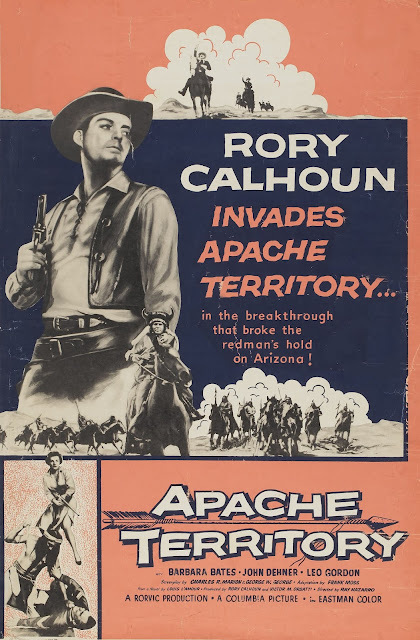 Released at a time when there was no such thing as too many westerns, Apache Territory benefits today from clean 1.85 presentation on TCM and Columbia On-Demand DVD (VuDu also streams it in HD), helping a routine pic approach enjoyable. Loved your phrase "released at a time when there was no such thing as too many westerns". Ain't it the truth! 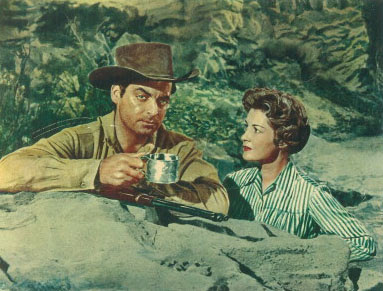 As a matter of fact, the timing on the Rory Calhoun article was especially good for me - as just yesterday I watched another of his Bryna productions, "Ride Out for Revenge"(1957). A very solid black & white oater with illustrious support from Gloria Grahame, Lloyd Bridges and Vince Edwards. The 50's was blessed with a lot of really first-rate (and prolific) western stars. Of course, the best of the Randolph Scott/Budd Boetticher films were in a class by themselves. But screen cowboys like George Montgomery, Joel McCrea, Dale Robertson,etc all left us with some pretty entertaining 50's legacies. And - of them all - I think Calhoun may have been the most naturally charismatic. He deserved to be bigger - and better remembered. "Gunsight Ridge" should check them out on DVD asap.